Over the last 10 years we've learned that the changes seen with facial aging are caused mostly by the loss of bone and fat that previously filled out the skin like a frame under the canvas of a painting. It became apparent that facial sagging wasn't due to gravity or loose skin which explained why facelifts didn't restore the facial contours seen in youth, but instead often gave results that looked pulled or "windswept". 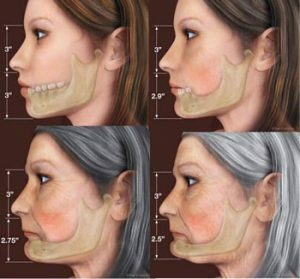 Recent studies have shown that certain areas of the facial skeleton undergo resorption with aging more than others, especially in the areas of the outer jaw & the chin, the front of the cheeks, below the eyes, and under the nose. These areas lose their mass in a predictable pattern with aging. Women usually start losing bone volume in specific areas of the face by their early 40's, and men by their 50's. For example, as the mandible (jaw bone) loses volume, as illustrated below, the skin is no longer supported and slides towards the sides of the chin where it becomes jowls and extra skin under the chin. Replacing lost facial volume from aging with dermal fillers can produce remarkable natural-looking results until significant bone loss has occurred. At that point, without bony support under the soft filler layers, too much dermal filler start to look "doughy" & unnatural, especially with animation. 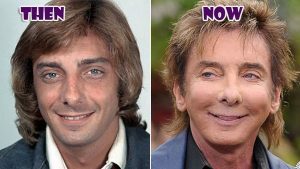 A clue is that when someone smiles and their cheeks protrude forward farther than their nose, they've either had too much dermal filler or they've lost too much bone to "youthanize" their appearance with fillers alone. Obviously the best way to restore a youthful face that's lost a significant amount of bone would be to replace the actual lost bone, but until now, no technology has provided an answer to restoring or even halting the facial bone loss from aging. After months of reviewing the most recent research, Dr. Elliott has developed an exclusive, proprietary protocol that may help to restore and augment facial bone volume. 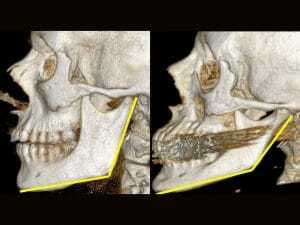 Multiple sessions will be needed to produce noticeable facial bone restoration but the results should be cumulative and maintainable once the desired outcome is achieved. The treatments are virtually painless and each will take 30 - 45 minutes depending on the area treated. f you are interested in learning more about how facial volume treatments can improve your appearance, schedule a complimentary consultation by registering online here or by calling 727-571-1923.